Reports have surfaced that Deutsche Bank has been mandated to arrange a European marketplace loan securitisation of loans originated by Funding Circle, the UK's largest SME marketplace lending platform. KLS Diversified Master Fund is the asset manager behind the transaction. The super senior tranche has been assigned a provisional rating by Moodys of Aa3 - the fourth highest rating that Moodys gives and a full six notches above the rating assigned to the senior tranche of the first publicly rated marketplace securitisation, managed by BlackRock in January 2015. This long awaited transaction will be the first of its kind in Europe, however several similar deals have been done in the US over the past few years. According to the reports, Deutsche Bank has been mandated as sole arranger and lead manager for the proposed transaction. The German bank has been rumoured to be building expertise in marketplace lending for some time. A member of Funding Circle’s capital markets team made the rare move from fintech back to banking late last year, joining Deutsche Bank. AltFi understands that Funding Circle will meet potential investors early next week to discuss the deal and, subject to the outcome of those meetings, sterling denominated asset backed securities may be issued. Furthermore, there are indications that any deal will be publicly rated as pre-sale reports from Moodys and S&P have been published. Moodys are already familiar with the UK marketplace lending sector, having published a report on the securitsation of European marketplace loans in May 2015. The Moodys pre-sale report details that the securitisation has a term of eight and a half years (albeit the pool of loans is static with an average remaining term of 3.7 years). Six tranches will makeup the securitisation. The four senior tranches will be rated Aa3 to Ba2 with the two most junior tranches being unrated. The top rated tranche is £88.4m and its Aa3 rating will give it appeal to investors who have thus far not been attracted to European marketplace lending. The total size of the transaction is targeted to be £130m which equates to just over 2 months total origination for the Funding Circle platform at current run rates. Just under 2,500 loans make up £121m of this number - loans that were issued between November 2015 and February 2016 and are already in the portfolio. The transaction size is close to that of a similar US deal for BlackRock that was completed in January of last year and saw the issuance of $330m asset backed securities. There is, as yet, no word on the pricing of the individual tranches, however the weighted average interest rate of the portfolio is 9.6% which would imply that the portfolio is weighted to the higher quality Funding Circle loan offerings. The announcement of the deal comes at a time when marketplace securitisations in the US are under more scrutiny than usual. Earlier this week, there were reports that Citigroup was calling a halt to the securitisation of Prosper loans. And in mid March Moody’s put 3 bonds of a Prosper securitisation on review for downgrade citing higher than expected losses within the portfolio. 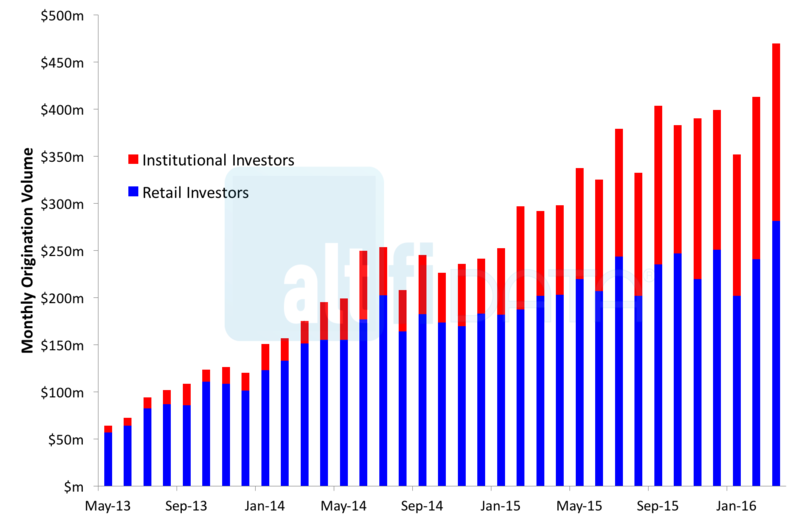 Institutional investor involvement in UK marketplace lending continues to increase, with AltFi Data estimating that 41% of all UK marketplace loans originated in Q1 2016 were bought by institutions. The first European marketplace loan transaction is a natural progression in the diversification of funding sources in the UK industry. This year’s AltFi Europe Summit featured a panel about the advent of securitisation in European marketplace lending, and it was clear that plans were being laid. Amongst others, representatives from Funding Circle and Fitch Ratings discussed some of the finer points of marketplace loan securitisations. You may watch the panel via the summit highlights page here.